This is another “Food Paradise” favorite that I found on the Travel Channel. 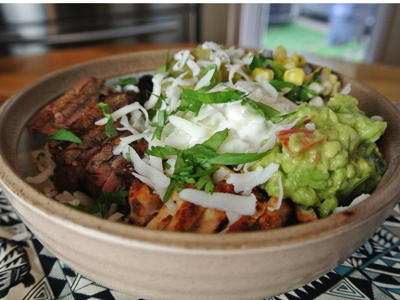 It comes from the Taco Guild Gastropub in Phoenix, AZ, ranked No. 2 on their countown. One of their signature tacos uses a rub that coats big chunks of beef with cocoa powder, espresso powder, Ancho chiles, plus a few more flavorful ingredients. Once the beef is saturated with the rub it goes straight onto a hot grill to sear. The beef is turned over each side to sear until it is a bit charred and dark in color. Next place the beef in a roasting pan and pour brewed coffee over it. Cover it with aluminum foil where it goes into a 300 degree oven for 5 – 6 hours. It is so tender and so flavorful when it comes out of the oven and virtually falls apart at the slightest touch. Taco Guild serves their tacos with a mango salsa topped with cotija cheese. I have to say they were spot on as the mango salsa added just the right amount of sweetness to balance the cocoa and coffee flavors. There was a lot of shredded beef to go around. I don’t know exactly how many tacos we ate but for several days we were in taco heaven. May the luck of the Irish be with you! Here in Kansas City there are always celebrations taking place in honor of St. Patrick’s day. You might see green water flowing through our “City of Fountains” or witness the largest St. Patrick’s parade anywhere. Also one of my favorite bands,”The Elders” return home for their annual “Hoolie” concert. It’s a festive time to be sure! While others cook a more traditional Irish feast, I’m going with something fun. I’m pretty sure nachos are not something you would find on a true Irish menu but it’s something that is festive and fun to eat. It starts with thin sliced potatoes baked crisp in the oven. These chips become the foundation topped with a tangy Irish cheese sauce and loaded with anything you want. As you can see, I like a lot of toppings! 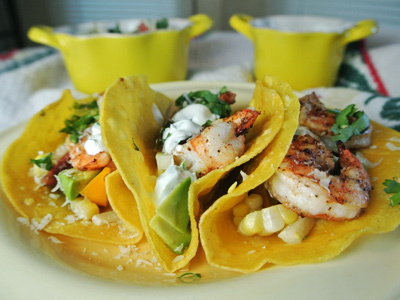 I’m still on an Aussie kick, this time I’m having summer shrimp tacos with a fresh jicama salsa and jalapeno cream. The medley of colors, textures and flavors are so appetizing starting with the salsa which is made from fresh ingredients with a bite of crunchy jicama. 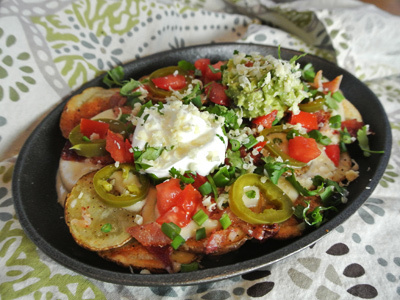 And topped with sour cream with roasted jalapenos to add a bit of spice. 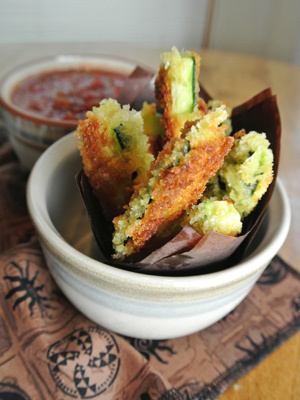 Everybody loves finger foods that you can pick up with your hands to eat. These were no exception literally being wolfed down in minutes. Portion control just went out the window!